June 24th, 2014 – Today, The Global Commission on Drug Policy (GCDP) a group of distinguished international leaders including seven former presidents – is launching the campaign, “Hey, We Need to Talk About Drugs”. 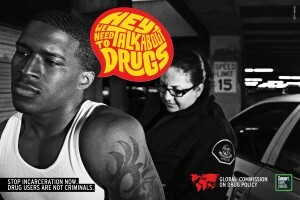 A series of advertisements addressing key facts and recommendations around the failure of the War on Drugs and the growing political debate on alternatives to approaching the issue. With the aim to strenghten ongoing social awareness and human rights advocacy efforts, the “Hey, We Need to Talk About Drugs” outreach strategy is being launched in coordination with the Support, Dont’Punish campaign and its 2014 Global Day of Action on June 26th. In 2011, the GCDP broke the taboo and published its first evidence-based report illustrating the failure of the repressive model and the need to look for alternatives to reduce the social harms of drug abuse while dealing with violence and corruption. Since then, the Comission has been advocating for drug policy reform at the highest political and public fora and published two other technical reports, showing the links between the criminalization of drug use and the spread of HIV and Hepatitis C epidemics in several parts of the world. The “Hey We Need to Talk About Drugs” campaign is a step forward on broadening this debate, something it intends to continue beyond 26th June. Over the last 3 years, a dynamic political process has been set in course with Latin American countries such as Uruguay, Colômbia, Mexico and Guatemala taking the lead on voicing the need to as well as changing the approach to drug control. Moreover, the cannabis regulation process happening in the US states has further pushed the public perception on the inefficiency of the current regime. This has resulted in the convening of a UN General Assembly Special Session on Drugs to happen in 2016. Such high level meetings to discuss the international system on drugs has not happened since 1998 and may represent a major paradigm shift on the 50 year old consensus that underlines the War on Drugs.